Your first lesson, basic tuning. How to read tab. 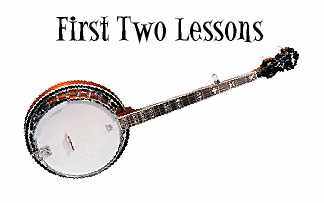 Your second lesson basic major chords, basic rolls. You will need to download and install Real Player G2 in order to take advantage of the free lessons with voice instructions, and to hear my tunes included on this site. Its a free plug in works at thousands of sites on the web, and its free. Ok there are a few set backs, one, is the wav files are shrunk considerably small, so the quality isnt as good as cd quality, and I used a web based streaming technology so you get nearly instant downloads, however sometimes the net is congested and blocks the stream. However over all, its the best way to get sound on the net. Its fast and audible. And its free.You can get a free copy by clicking here. And of course you need a 5 string banjo, and that's not all you will need, if you haven't done so please go to my Accessories page and read it. For lesson one click here. This will take you to both text and voice. For lesson two click here, currently text only,voice instructions coming soon. So quit horsing around! Get thet banjar and learn!